I know it’s been a long while since I have actually sat down to do a blog for Thoughts of yaussiechick. I have been working pretty much none stop for 6 weeks which was awesome. The place I am temping at now has not wanted me since Monday. I am not sure when I will be in next but at least I did get a chance to take Adam and myself up to Dorrigo National Park last Thursday. I am finally feeling like sharing again. I always want to share but after not working for ten years and then going back to work for 6 weeks I didn’t really feel like being at the keyboard. Now that I have the time to do it, I am looking forward to showing you a couple of clips that I took at the Skywalk at the Discovery Centre at Dorrigo National Park. Adam and I also did an audio blog but I am not sure how interesting it would be for you guys. It is almost 47 minutes long. I did take quite a few pictures on the little walk that we did. At the end of the Skywalk, there is a little pedestal for you to place your camera on so that you can take pictures on yourself with a timer. The camera that I had didn’t have a timer so I choose to do a tiny video. I followed this up by trying to take a picture of the view of the ocean from the Skywalk platform but forgot to switch the mode on the camera so you get to see a glimpse of it as video. It’s winter now in our little piece of paradise. It’s cooler in the mountains but as you can see, Adam and I don’t have to rug up like we would if we lived in a cold climate such as the northern regions of North America. I think we sort of regretted not bringing light jackets but over all, when we were walking we didn’t notice the coolness in the air. I am pretty spoiled. 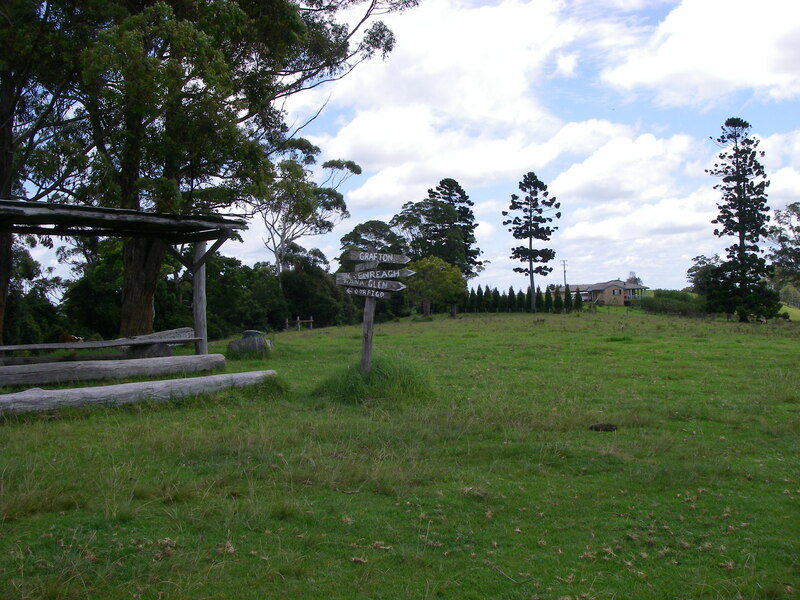 The drive up to Dorrigo National Park off the Pacific Highway is on Waterfall Way. It took me almost 2 hours to drive up there. It would have been quicker if there hadn’t been construction going on but hey, I am not really complaining. When you drive on the Waterfall Way, you do get to see a couple of waterfalls as you drive past Thora to get to Dorrigo National Park. 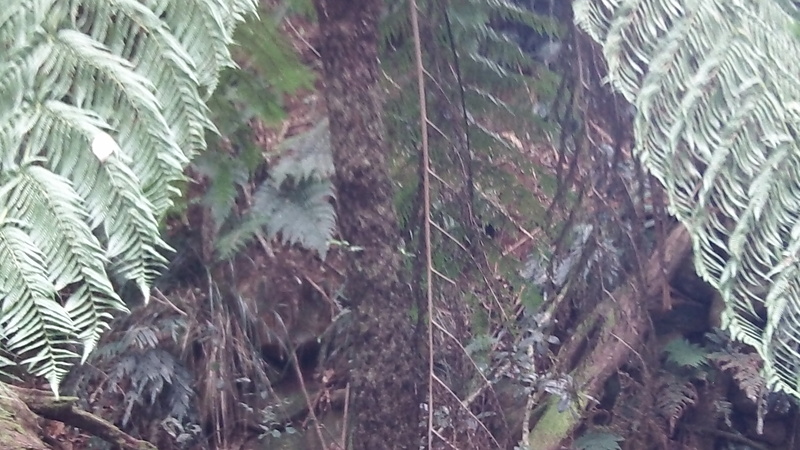 In the town of Dorrigo there is another waterfall that you can drive to and then walk up to. It’s called Dangar Falls. Adam and I have done that before. I will have to delve into my computer to try to share more of the sights I have seen to share with you all. This has got to be one of the best reasons why I feel in love with the Coffs Coast. It is to me like a piece of paradise on earth. If you ever have the inclination to come to Australia, I would strongly suggest visiting this area. Imagine being able to live either in the mountains or down by the coast and be able to drive up into the mountains to see the beauty of nature so close to your home. It’s a real mind blower! I still pinch myself when I realize that I actually live here. I have always loved waterfalls. I have always loved being out in nature. I have always loved the mountains and the beach. 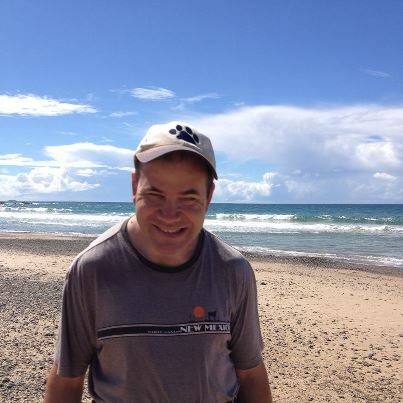 I look at the beauty of Australia and know I have only begun to scratch the surface. This land is ancient. It’s people so wise because they valued the land and spirits. 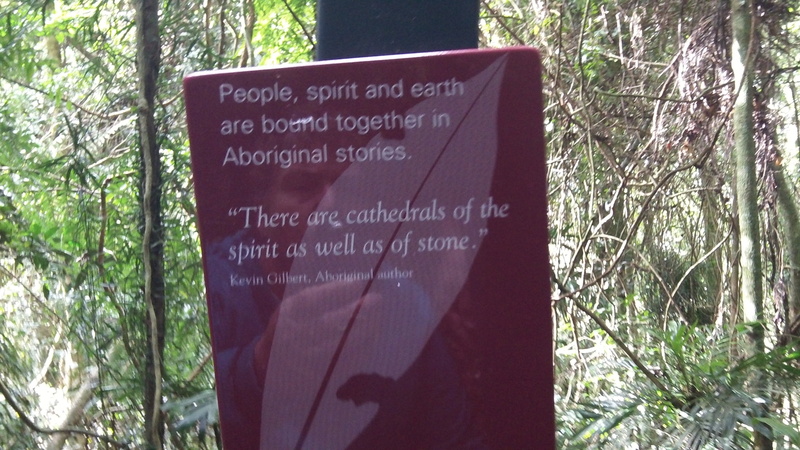 I know I am not born Aboriginal but I really appreciate their outlook on their heritage. There is so much to learn from them. I saw this on the walk and thought to myself how beautiful to make this connection. 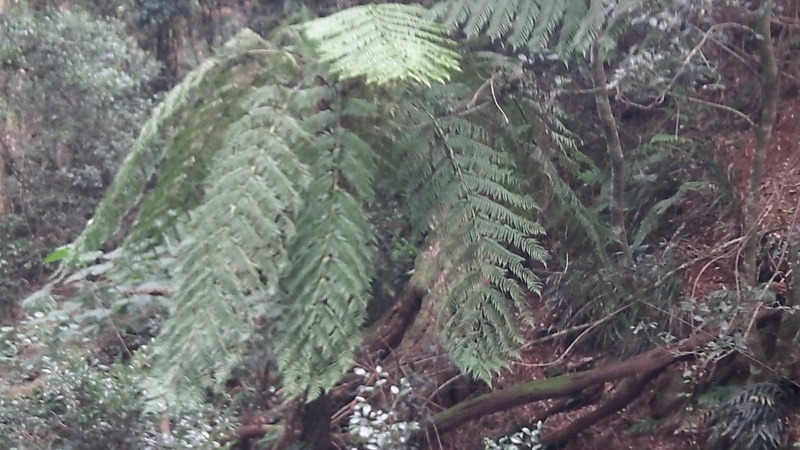 I had never seen fern trees until I came to Australia. I get to see them when I drive to work on Toormina Road. I still feel wonder. You know you are looking at something extraordinary. You see how timeless this land is and how blessed it was to still have trees and grasses that haven’t really changed much at all. I tried to take a good picture of a fern tree to share. I don’t think I did it justice. The actual trunk of the fern tree. I don’t think you can really see how it’s growing. 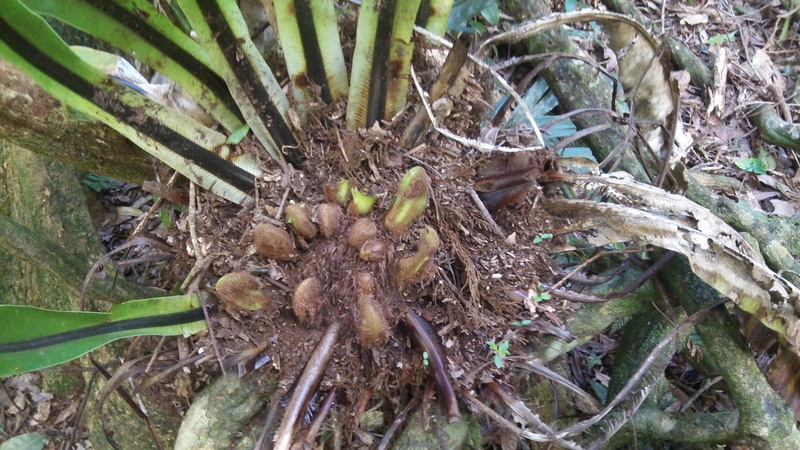 Another view of a fern tree from the top. I love seeing new growth in the forest. 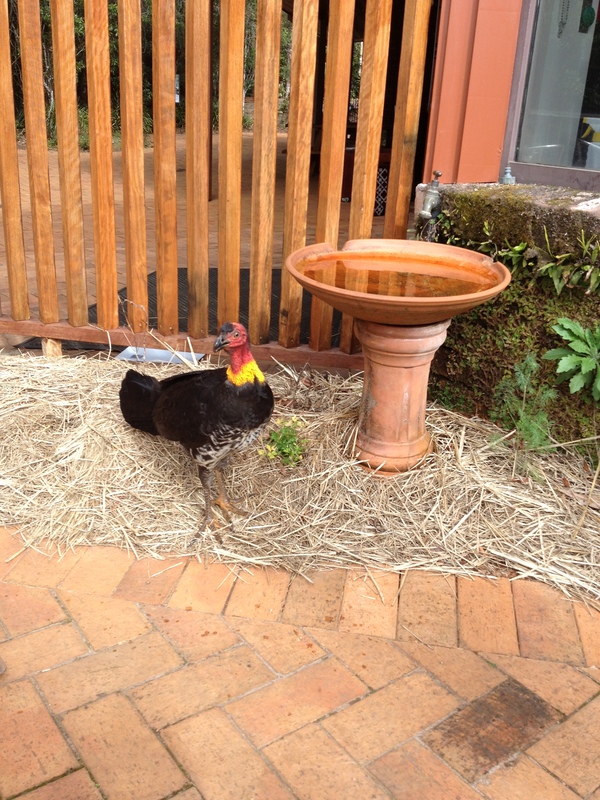 Even the Brush turkey wanted to pose for me while Adam and I refueled after lunch. 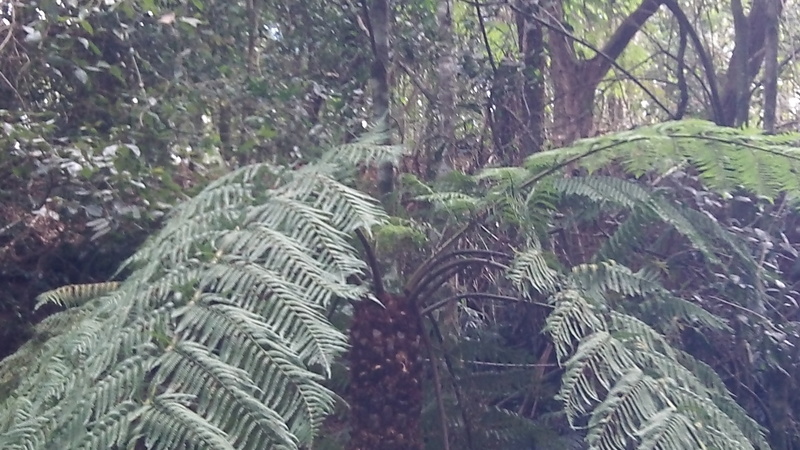 I realize that I am not really doing Dorrigo National Forest the great write-up that it deserves. Adam and I only ventured a little bit. We want to go again in the summer but it was a nice change all the same for us. I don’t think I will ever fall out of love with the Coffs Coast. Yesterday I was going through my morning rituals when I heard this song which I love by one of my favorite bands on Pandora Radio. As I was about to get in the shower, it sort of hit me that this is how I feel about blogging. Sometimes you just write because you are in moment or you want to just share something, anything that will make a connection to someone else. It’s the most exhilarating feeling when you know you have done this. I don’t write for the money. I don’t write for the fame. I write for the love of sharing. I write for a connection with others. It’s like everytime I hit that publish button I am hoping, praying that I will get to read from someone who is also sending out a SOS. I am reaching out in hope that maybe somebody identifies with the moment and will actually acknowledge it. I have gotten a few messages back. When this happens, it’s just amazing. The likes are fantastic too but the wow factor for me is when I actually get to read a comment. I can’t imagine ever getting a million responses back like he talks about in the song but that feeling of wonder I identify with so vividly when I read a comment or see a like. Maybe one day I am going to see lots of responses but until then I will keep on writing, keep on sharing, and keep on reading! Do you ever feel like this? If so, please feel free to share! I know it’s not like me to do two blogs in one day but something has happened to me and I wanted to share it because it feels special. I would even venture to say extraordinary. I have noticed that things don’t just happen by chance. I am really realizing this today because there are things that I am feeling very bombarded with but not in a bad way. I read two blogs earlier or maybe even 3 which really affected me. All 3 were written by fellow bloggers whom I really respect and they have a very loving spirit. The first one was by Anne Birkelo http://ambirkelo.wordpress.com/2013/05/15/tuff-enuf/ It was something that I really needed to read at the moment and still struggle with a lot but I am trying to rely more on the wonderful Spirit that our Lord has given us because I am trying to be the person that He wants me to be if I only learn to trust in Him more, to surrender all. The other blog that I read was by Meg at Firsttimefreedom http://firsttimefreedom.wordpress.com/2013/05/08/brother-and-sister/. This reminded me that we all have family that we love and long to know better but the one that really smacked me upside my head was by Kozo http://everydaygurus.com/2013/05/15/daily-dose-of-vitamin-s/. He posed a really wonderful picture of needing our daily dose of vitamin S. I was trying to think of a really cool response to him but couldn’t think of one when a good friend of mine contacted me on Facebook to let me know that his dad arrived to his home and how happy he was. My friend has a really debilitating autoimmune disorder. His wife is trying to help him with their small children but I think the fact that his father, who traveled all the way to Canada from Australia just to be with them in his most troubled time of need just gave me a wow moment. I am not talking World of Warcraft sort of wow moment but a really goose flesh sort of in awe kind of moment when I knew for certain that there was a higher power out there. I look back on my life and where I thought I was and where I am heading with this hope that I will be able to help others on their journey in this life. We all need encouragement and the best source I found for encouragement is a good dose of Vitamin S that Kozo blogged about. I found that Vitamin S (the Spirit) while talking with my friend who is in Canada. I try to see the Spirit in every person I encounter and I pray that they will see that same Spirit shining back when they encounter me. 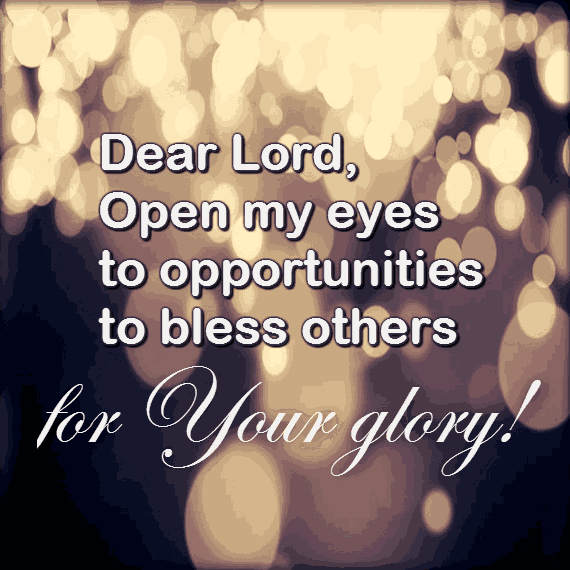 I am just a child compared to God and I want to make Him happy because He has blessed me with this wonderful life at this wonderful time. I know I had been very cynical inside but that boost from my friend has buoyed me up as well as these beautiful blogs that I have posted here. I will leave you with a photo I saw on Facebook today. For my 50th blog, I thought I would share something that I wrote for Adam after he first came to see me in 2001. It’s really funny how things happen. I like to think things happen for a reason. I am sure there are probably skeptics out there. It’s fine because I have enough faith. I always say that to Adam half jokingly. I know I could probably do something more spectacular but since it’s my 50th blog I wanted to do something special for myself and my fella. Every fiber of my being says it’s true. You say my name and I am moved. I know the meaning of happiness’ bliss. Just as you know it’s the same for me. I know that we are meant to be. Today I am cheating a little bit. OK, I am cheating a lot because I feel this old email was so beautiful I wanted to share it with everyone. I can’t take credit for writing it. I am pretty sure you may have already seen this in one form or another but it’s a great reminder. I love this a lot and while working on my facebook page stumbled upon it. A friend had sent it to me, I shared it with Adam back in our courting days and now I am sharing it with you. With the week I am having, I can’t help but feel sentimental. but if it does not, be content it grew in yours. strong, enough sorrow to keep you human, enough hope to make you happy.